Individual Insurance Plans for members and their families. There are several unique programs currently available. Are you in reasonably good health? Do you want to buy up to $1,000,000.00 of insurance quickly? 30 minutes of your time from start to finish to see if you qualify. Are you looking for a Life Insurance Policy that also lets you access the Death Benefit if you have a chronic illness? In addition, if you qualify, at the end of the year 25 if you wish to surrender your policy, all of your premiums will be reimbursed to you. Do you need coverage for a period of time? Term Insurance, 5 - 30 years? Good health or poor health, we have over 40 companies available to us to give you the best possible rate available. Let us assist you! For more information schedule a call with Mort Potoff at Book Here or call toll-free 800-749-2118. The Long Term Care Insurance Industry now prices policies based upon gender, with females paying much higher rates than men. The Massachusetts Bar Association's Long Term Care Insurance Program allows members the opportunity to purchase coverage under unisex pricing from Transamerica. Females purchasing through the MBA Long Term Care Insurance Program can save up to 55 percent versus buying Long Term Care Insurance outside of the program! To request information on this program, call 1-(800) 749-2118 and speak with Morton Potoff or email massbar@mjpwealthadvisors.com. The benefit of disability insurance cannot be denied. If the Association Disability Plan is not right for you, we offer an individual plan that can be tailored to meet your specific needs. The individual plan is subject to an association discount. You will be issued an individual contract rather than a group certificate. For a customized quote, please click here to complete an insurance information request form. For more information, please call Mort Potoff at MBInsurance (800) 749-2118. An Accident Protection Insurance plan can help protect you from the unforeseen expenses caused by a covered accidental death or injury. Disability income insurance can help protect you and your family. Carefully chosen life insurance coverage can help ease financial strain and provide money your spouse and dependents need for a secure future. 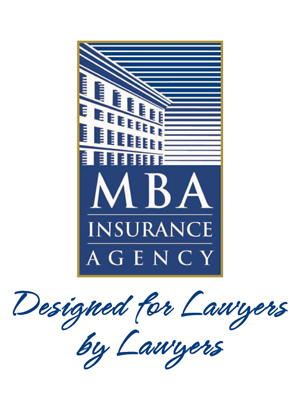 MBA is pleased to provide you with a term life insurance plan that will allow you to provide a safety net in the event of your untimely death. By planning ahead, you can provide for your family's future.